Whether you are a world class athlete, prep coach, or someone simply trying to live the healthiest lifestyle you can, it’s not easy to have all the answers. Many things have to go right to be successful in any challenging endeavor, the two most important of which are staying motivated and focused. But when all the necessary pieces come together, it’s not only gratifying and exciting, but it paves the way for a future filled with top performances. How to set challenging but attainable goals? What is the right training program? How to transform a strong group of individual contributors into a winning team? How to recover from a physical or mental set back? Why is eating healthy so important to performance? For more information, please contact Kaye Anne directly at kaye@thumbsuprunner.com or reach out to her on twitter at @kannepappas. 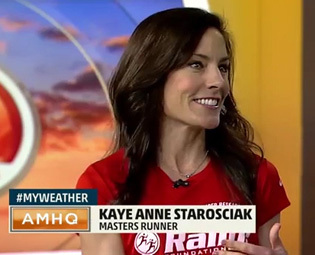 A recent appearance on the Weather Channel’s AMHQ with Sam Champion. 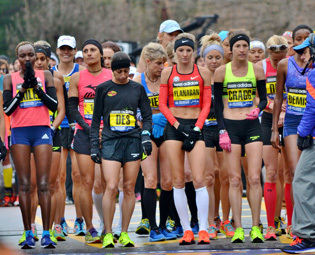 Lining-up with the world’s elite at the 119th running of the Boston Marathon. 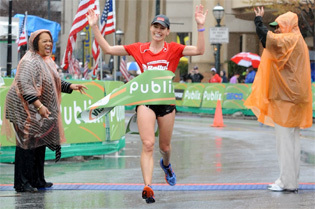 Breaking the tape at the 9th Annual Publix Georgia Marathon in Atlanta. 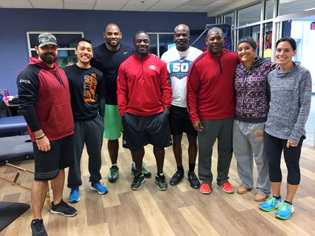 Working with former NFL players and a great group of professionals from EXOS.